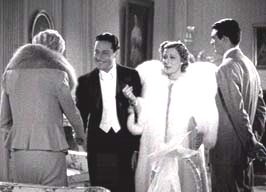 Another classic screwball comedy from the 1930’s. Jerry and Lucy Warriner are about to finalize a divorce which includes a custody case over the rights to their dog! But before matters are set in stone each decides to ruin all prospects for the other’s chances of remarriage. Though Jerry is intent on remarrying to socialite Molly Lamont, and Lucy to oil-mogul Daniel Lesson, each tries to outdo and undo the other which results in hilarious and rather compromising scenarios. 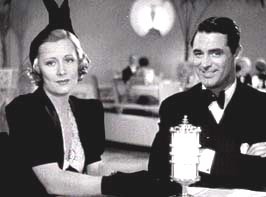 The cast includes: Cary Grant, Irene Dunne, Ralph Bellamy, Alexander D’Arcy, Cecil Cunningham, Molly Lamont, and Joyce Compton. Tagline: It’s a Glorious Comedy… Uproarious Romance! 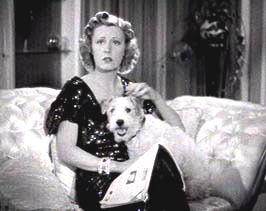 Based on the stage play, “The Awful Truth” is a hilarious comedy, that holds up extremely well. One can see why this screenplay won an Oscar, and many of it’s actors/actresses nominated as well. On his visitation days, Jerry (Cary) manages to slyly put seeds of doubt in a humorous way about Lucy’s new beau, Daniel ‘Dan’ Leeson (Ralph Bellamy), who is the simple, country Texan oilman, whose lifestyle in Texas is radically different from what Lucy is accustomed to. He seems to be a bit of a mama’s boy as well, who travels with his protective mother, Mrs. Leeson (Esther Dale). Ultimately, Jerry inadvertently helps to finish off her impending mismatched marriage to this country boy, while taking care of personal business with the music teacher, in a rather funny sequence of events. 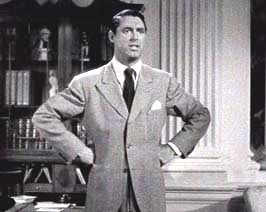 Lucy (Dunne), however, realized before this disastrous chain of events mentioned above, that she really does love Jerry (Cary), and couldn’t possibly marry the Texan, and wants to mend things with Jerry. However, her music teacher gets in the way in her apartment, after she asks him to tell Jerry that nothing romantic had happened between them. 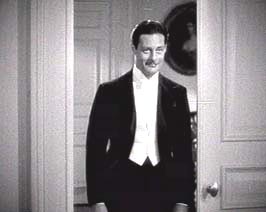 He hides in her bedroom when Cary arrives suddenly, but his black hat remains. She tries to hide it, but the dog keeps retrieving it. Dunne tries to convince Cary that this too big hat was really his, which he momentarily believes. When it looks like they both want to try to work things out, the Texan and his mom are at the door, so Cary hides – in the same bedroom that the music teacher is in. Fireworks happen that dash this near make up, as well as end the prospect of Lucy’s unwanted marriage to the Texan. However, when Jerry (Cary) starts dating and proposes to a snooty society girl Barbara Vance (Molly Lamont), Lucy (Dunne) does him a favor and breaks up his impending marriage. 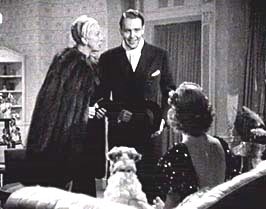 Dunne shows up as Cary’s sister at the new fiancee’s family mansion, acting in an obnoxious manner to offend everyone, by her crazy dress style, her lack of social manners and class, and the performance of her song that she copied from a night club routine, seen earlier in the movie, where a wind blows up the dress during part of the song. She refuses the offer of sherry, and asks for something a lot stronger. She runs after the butler, and secretly has him put gingerale in her glass. Her coup d’etat is that she chug a lugs what they think is hard booze, and then pretends to be drunk, thoroughly convincing Cary, who insists on driving her up to her dad’s cabin. They, of course have a few hilarious mishaps along the way, with the police and the car. How they finally come back together makes for an amusing ending to this sparkling screenplay. This movie is so well directed, well written, well paced and well acted that it is a timeless screwball classic comedy. I recently saw this film in an intergenerational audience, from teenagers – to people in their 70’s and everyone just roared. Everything comes together to give us a priceless jewel of a comedy.